I don’t know about you, but when my husband travels for work it feels like a huge part of my heart is missing. The days often feel longer, more chaotic, and sometimes, down-right lonely! 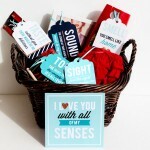 That’s why The Dating Divas have created this exclusive WELCOME HOME KIT to celebrate the return of your loved one! This DIY party pack is gender-neutral – and contains EVERYTHING you need to make your spouse feel loved and valued! 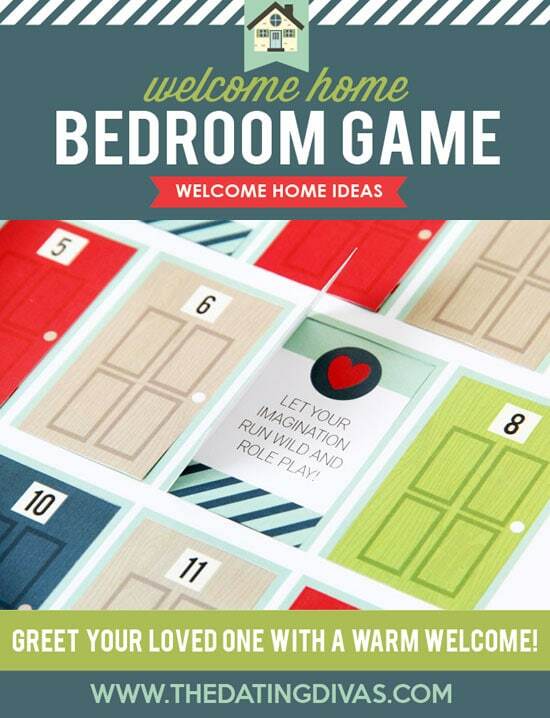 Your kit includes great Welcome Home ideas from airport signs, to meal printables, to spicy bedroom activities- we’ve done all the work for you, to make your sweetie’s homecoming extra special! Courtney of All Things Bright and Beautiful did an AMAZING job creating a one-of-a-kind welcome home printable party pack! We just adore Courtney’s inspiring combination of text, colors, and graphics! Just wait until you see her incredible design skills in each section of this gorgeous downloadable kit– your loved one will truly be showered with love and welcome home wishes! Our exclusive homecoming celebration kit gives you everything you need to throw a welcome home party that your spouse will cherish. Maybe he or she has been away on business for a few weeks…. or perhaps, your loved one is finally coming home after a several month deployment. WHATEVER the circumstance, each category in this beautiful welcome pack is designed to make them smile and warm their heart. Doesn’t this pack sound great so far?!? We also have even MORE great ideas for long distance relationships in Diva Central! 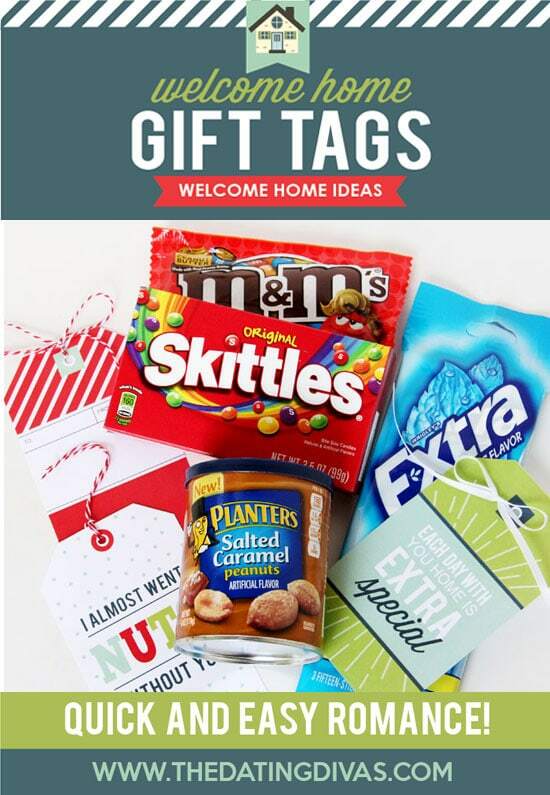 Ready to see all the details included with your DIY Welcome Home Celebration kit? I thought so! With just a few supplies, you can craft the perfect decoration to display on your mantel or across a window to announce that homecoming in style. 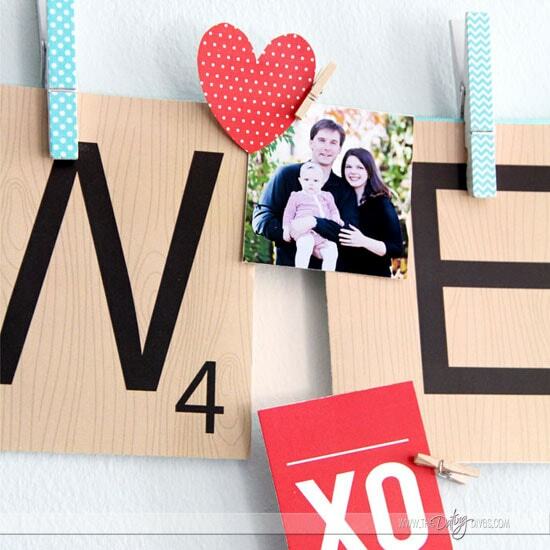 I absolutely LOVE how this darling printable banner can be personalized with family photos. 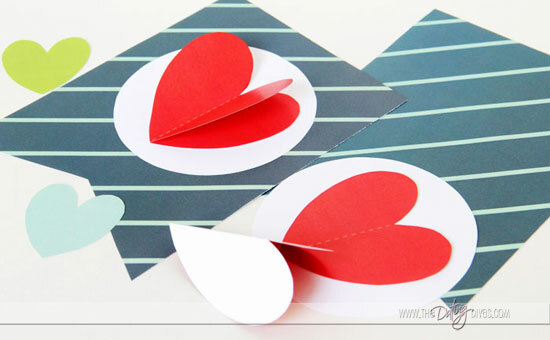 Our designer Courtney even included little heart pieces that you can “pop” up for added interest and dimension! This celebration banner is so stinkin’ cute that I plan on leaving the “welcome” portion up as part of my Thanksgiving decor this year! The sky’s the limit on how creative you can be with this cute DIY craft… simply print and go OR spend a few minutes adding special family pics and embellishments. After a long plane ride, can you imagine what an instant pick-me-up seeing this sign would be for your returning spouse? 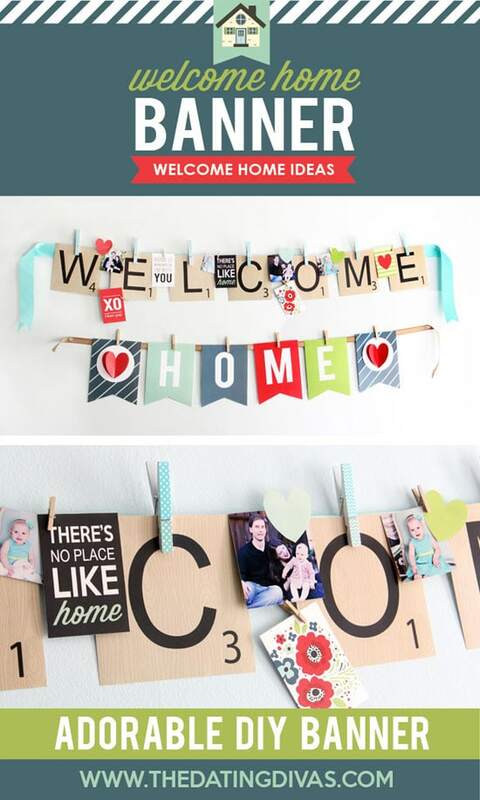 Our Beautiful Printable Sign + Your Thoughtful Wishes = 1 Amazing Welcome Home Greeting! To make this over-sized sign, just take our printable design to your local copy shop and ask them to print it in black and white as an “engineer print.” The total cost of this project was right around $3.00 for a 24 x 36 sign! 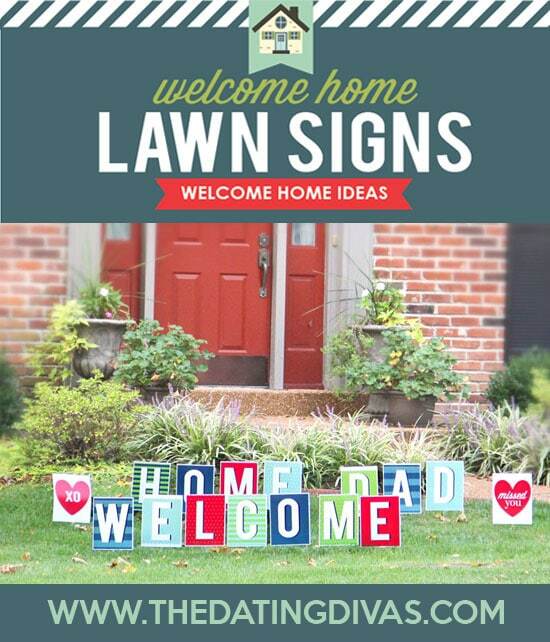 Once your welcome home sign is printed, have fun (with your kiddos!) writing in all the reasons they missed Mom or Dad. These little signs can make a BIG impact, as you let everyone know how happy you are to have your love home! 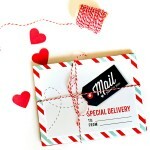 Make your sweetie’s arrival extra special, from the moment he or she pulls up to your home. Remember, your kit includes gender-neutral printables that will bring Mom or Dad home in enviable style. 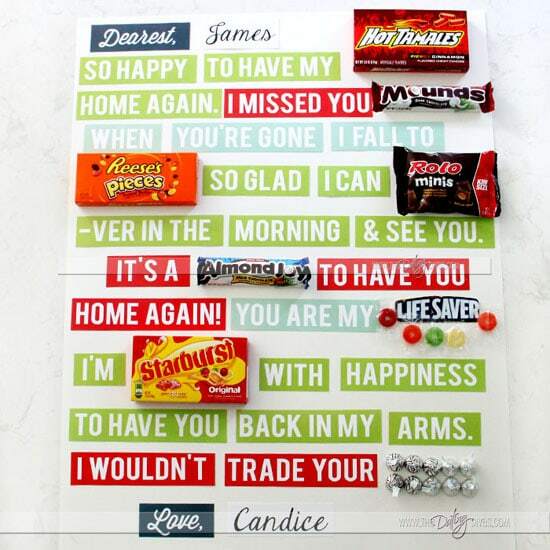 Grab a few candy bars, a piece of poster board, and our printable phrases to construct the CUTEST candy gram welcome back greeting! Indulge your spouse’s sweet tooth and give them some extra lovin’ with these adorable tags that attach to your sweetie’s favorite treats. These great welcome home ideas include fun sayings like “I almost went NUTS without you,” and “We are going to have a WHOPPER of a good time celebrating your homecoming!” … as well as several blank ones for you to customize. Spoil your love with their favorite meal when they return home. 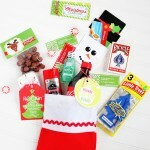 The gorgeous printables included in this party pack will make your meal one to remember! 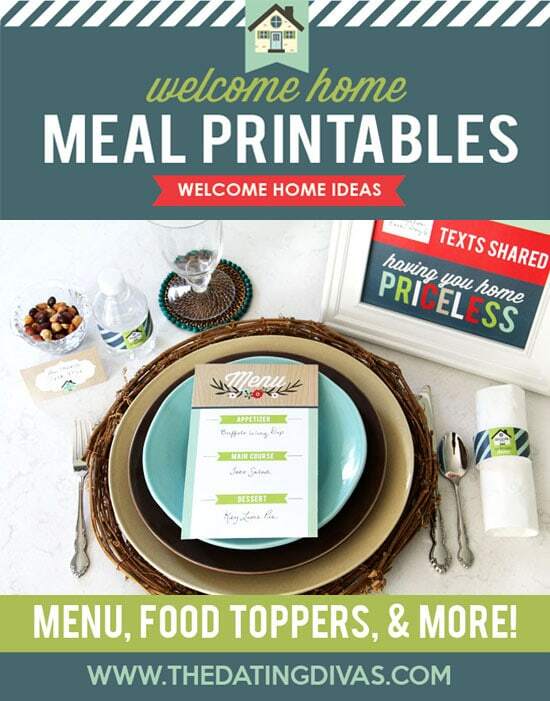 Your Welcome Home Meal Printables also come with a darling printable table sign that you can personalize and frame… it’s a beautiful reminder of what welcoming your spouse back means to you. Tip: After your celebration is over, take your personalized sign, add a picture from your sweetie’s welcome home party, and place it in your family scrapbook. 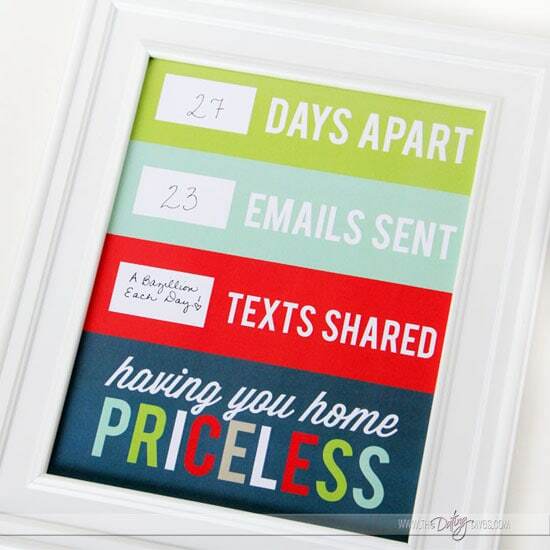 It’s an easy way to document all the love shared while apart AND the joy celebrated upon their return! 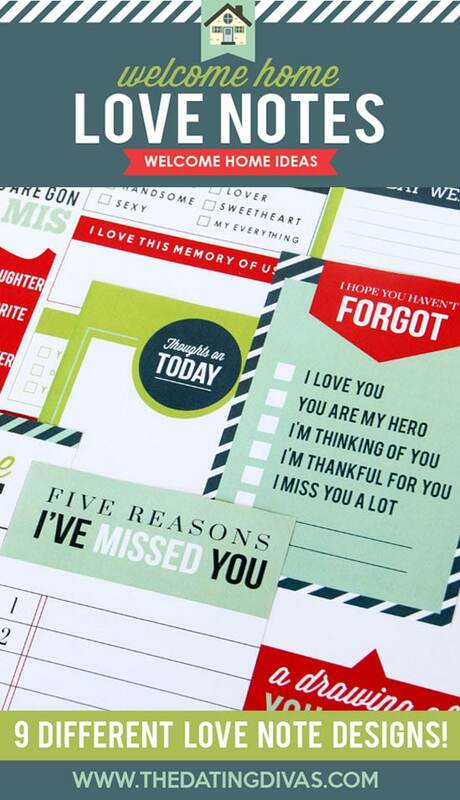 Use these printable notes while your loved one is away to give them a great way to reconnect when they come back to you! We’ve included not just 1 but 3 (yeppers, that’s correct!) different ideas in this category! Are you ready to make your spouse’s heart race? Our adventurous scavenger hunt leads to a VERY warm welcome if you know what we mean! 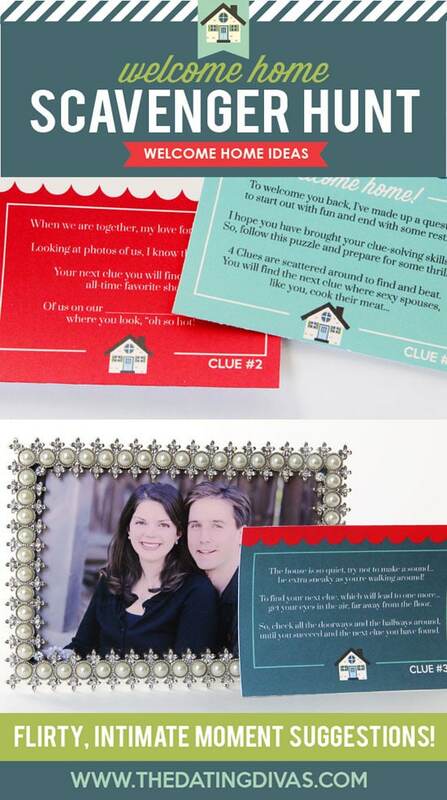 Simply leave our clue cards around the house at the suggested locations– it will definitely heighten the anticipation and suspense of your sweetie’s arrival home! Your clue cards will lead your love to the bedroom where you will be ready with a spicy, intimate game. You and yours will take turns rolling dice and finding out what suggestions are unlocked behind the different doors of our unique printable. Finally, in our intimate welcome home ideas section, you will find a sassy iron-on “Debrief Me” heart that you can add to a piece of lingerie to help you dress the part! No elaboration needed! Ha! Finally, we collected a few bonus ideas to make this the BEST homecoming ever! This bonus section contains a few extra ideas to spark your creativity for creating your perfect welcome home celebration. There you have it– tons of great ideas to make your sweetie’s homecoming filled with love. Our printable pack walks you through exactly how to throw a welcome home party that’s unique, personalized, and most importantly FUN! … And, now that your sweetie is home, don’t lose that romantic momentum! Keep the sparks flying by leaving him or her printable Post-It Love Notes the rest of the week. You could also check out our Quick and Easy Ways to Rock the Romance e-Book for even more fun date ideas! Cheers to the perfect welcome home celebration! Wow! This is seriously so beautiful! Very well designed! Now I just need my husband to leave out of town so I can throw him the party of the century when he gets back! Seriously in LOVE with this!!! This is an amazing Welcome Home Kit! My hubby travels A LOT so I can’t wait to use this! LOVE this!! Seriously – the cutest prints ever. Just pinned! I love EVERYTHING about this! You thought of everything! This is FANTASTIC!! My husband is traveling for PA school right now and gone 6 weeks at a time so we are going to put this to GREAT use!!! This is a great idea and I love that there are so many unique ideas that can be reused over and over again. And the fact that there’s aomething for the kids to do too! Question- Is there more than one airport sign/design in this package? Thanks! 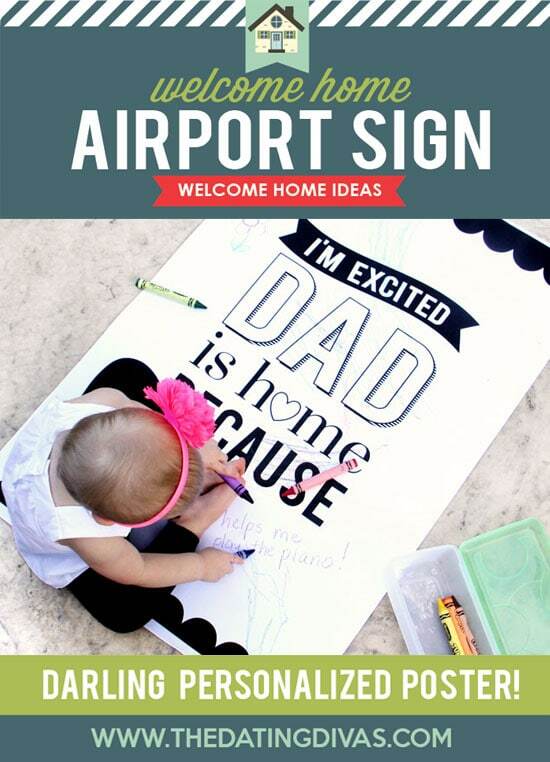 This pack includes a large airport sign- we’ve included a version for Dad and one for Mom. 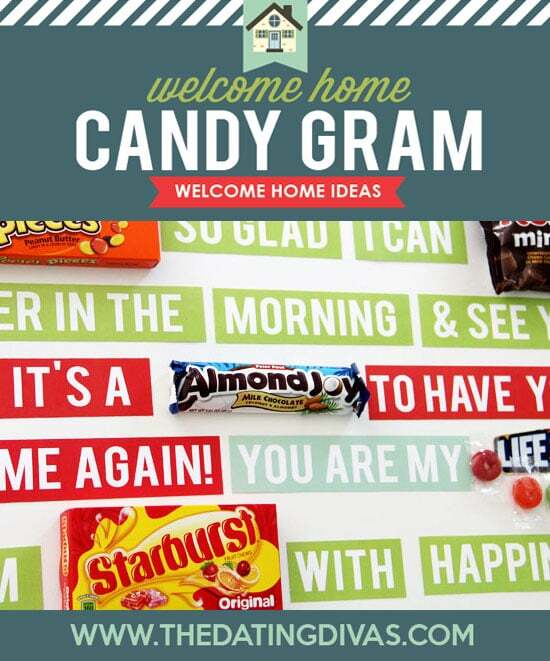 Our candy gram sign would also be a darling surprise for welcoming home a loved one at the airport!